The Irish dance class at Acton Ballet School have come away from the annual All England Irish Dance Championships with fantastic results. This competition attracted over 300 candidates from all over England and was judged by professionals who came over from Ireland. 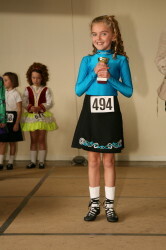 In the under 8 years category the youngsters won 6 out of the 8 competitions. Ciara Trollip won 4 and Melikah Chaba won 2. Jennifer Miller received a 2nd, 3rd and 4th place. In the under 10 years category Connie and Roisin Lynch, Millie Potter and Valentina Esposito Rodriguez all won 2 of their competitions with Natalie McNamara being placed in her very difficult grade. In the Cup championships Melikah Chaba and Ciara Trollip made it on to the podium in the under 8 years and 4 made it into the top 10 results with Connie Lynch and Millie Potter on the podium in the under 10 years section. These children have been very dedicated and worked extremely hard by attending 2 classes a week and a personal tribute must go to their teacher Laura Ryan who has encouraged and inspired these youngsters. Her Dublin schools must miss her!